Q: What was your vision for your wedding? A: Our vision for our wedding was to be married in a beautiful location, which would require little to no decorations so as not to distract from the scenery, to have good food and wine, and to be with our family and friends. Q: How did you choose your wedding dress? A: I was never the little girl that had a vision as to what her wedding or what my wedding dress might look like. I went wedding dress shopping with a very open mind. My only limitation was no ball gown, as traveling with such a large dress would be more than challenging. I tried every dress that was suggested, even if I knew I wouldn’t like it. The plan was simple. I would know the dress when I put it on, and that’s just what happened. It was simple, elegant and just right for me. Q: What made you choose Italy for your wedding location? A: Some of our favorite pleasures in life are travel, great food and wine. That was exactly what we were doing when we got engaged in Napa. So getting married in a vineyard seemed like the perfect setting. Except the perfect setting was very hard to find! Very few vineyards in British Columbia host weddings and we found the same in Napa. If we did find a vineyard, there was always something that just didn’t fit. Frustrated, I was telling my friend and co-worker how much difficulty we were having finding the right venue. She smiled and said one word “Italy” and that was that. We have never been to Italy, so how were we going to arrange a wedding? Easy. I went online and found a wedding site that I loved…TCF Tuscan Weddings. I phoned Tara Fontana (owner) and immediately knew she was the wedding planner for us. 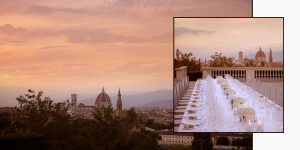 She listened to what we wanted and sent us a variety of different options of villas and vineyards…but then she sent us a picture of a terrace view over Florence that we will never forget. We knew then Villa La Vedetta was the venue for us. Tara confirmed that when she traveled to Italy and visited the villa and gave it two thumbs up. Q: What was your favorite part of wedding preparation? A: Our favorite part about the wedding preparation was listening to Tara talk about Italy. The people, the food, wine and the breathtaking views. We especially liked planning the BBQ we had for our guests the next day. The guests that did make the long journey to Italy to attend our wedding were also very infectious with their excitement about traveling to Italy and all the plans they were making. Talking to our guests about the wedding months in advance just made us even more excited. Q: What was the most memorable part of your wedding day? A: There isn’t just one memorable part of our wedding day, but many. Mom and I had our hair done by Rosie who was just so much fun. She made us look and feel fabulous! My dad seeing me in my wedding dress for the first time was special and when dad walked me down the villa steps and I saw Chris at the bottom waiting for me in his suit….tears. Our photographer, Andrea Pitti made us feel like rock stars, snapping pictures like the paparazzi. He took us to Piazzale Michelangiolo where hundreds of tourist moved out of the way so that we could have our photos taken with the view of Florence behind us. Chris dipped me and gave me a kiss and you could hear all the tourists snap photos of us. Then when we stood up, all the tourists clapped! The food and wine was great and the view was spectacular. We saw the sun go down and the full moon come up, not to mention there was fireworks going off in the distance too. Magic! We still can’t believe we went to Italy to be married. What a stellar way to start off your life as husband and wife. It really was like a fairy tale come true! *Photos by Wedding Photographer Andrea Pitti – Photos Property of TCF Tuscan Weddings and Andrea Pitti.